Blake Griffin and Stanley Johnson of the Pistons high five in a game against the Suns (Image courtesy of the Detroit Pistons website). The city of Detroit has yet to see a major sports championship since 2008, when the Red Wings last brought home a Stanley Cup. Detroit’s teams have gone through years of struggles. The Tigers last won the World Series in 1984. The Pistons last NBA Championship was in 2004. The Lions have yet to win a Super Bowl and their last championship was in 1957. The last few seasons have been rough for all teams. The Tigers have failed to make the playoffs in their last four seasons. The Pistons have only made the playoffs once in the last nine seasons. The Lions have appeared just three times in the playoffs since the turn of the millennium. The Red Wings have failed to make the playoffs in the last two seasons after a historic run. Overall, Detroit sports are in a downward spiral. There remains hope, but the hope is for the future. The Tigers had a rough 2018 season. They finished third in the worst division in baseball, the AL Central, with a record of 64-98. They were 27 games back from the division-winning Cleveland Indians, who had the worst record of any AL playoff team and the second worst record in the entire playoffs. The Tigers finished 12th of 15 American League teams while their division rivals, the Chicago White Sox and Kansas City Royals, finished 13th and 14th in the league respectively. The other divisional foe is the Minnesota Twins, who also finished below the .500 mark. This shows the overall weakness of the opponents that they faced 76 games out of the 162-game season, yet they failed to succeed anyway. They traded away all of their aging talent in the last few years, losing Justin Verlander, Justin Upton, Justin Wilson, Yoenis Cespedes, Joakim Soria, David Price, and J.D. Martinez. They also would lose star pitchers Max Scherzer and Rick Porcello to free agency. Victor Martinez retired after fighting through injuries the last two years of his career. Not much is left as the Tigers traded away nearly all their young talent during their glory years in attempt to win it all. The Tigers lone All-Star from last season, relief pitcher Joe Jimenez, finished the season with a WAR (Wins Above Replacement) of 1.4. Their best player on the season was outfielder Nick Castellanos, who had a WAR of 3.0. Their best pitcher on the season was Matthew Boyd, who had a WAR of 2.0 on the season. WAR measures how valuable a player is to their team in comparison to a league average player. The Tigers do have high hopes for their future, however, but it may take some time for their young talent to develop. They have a plethora of star pitching prospects as their top five prospects with Beau Burrows (Ranked the 86th best prospect in baseball), Franklin Perez (67th), Matt Manning (53rd), Alex Faedo(79th), and last season’s number one pick of the draft, Casey Mize (18th). With these prospects potentially all being in the major leagues by 2020, the Tigers could have the next powerhouse rotation of flame throwing pitchers. They aren’t as strong with position player prospects, however, as their sixth through eight best prospects are all outfielders in Christin Stewart, Parker Meadows, and Daz Cameron. They also have talented infielders Willi Castro, Isaac Paredes, Dawel Lugo, and Sergio Alcantara. The future is bright for Detroit, but it will take a couple of years at the bottom of the league before these players develop and the league begins to take notice of the Tigers again. The Lions may sadly be the brightest light that the city of Detroit has for the coming future in the NFL. With a 3-5 record so far to start the season, it could be far better, as they lost to teams they should’ve beaten and beat teams no one expected they would beat. If the Lions had played to their full potential, they could be leading the division. With star quarterback Matthew Stafford under center, the Lions will be a factor in every game. Even after the departure of fan favorite wide receiver Golden Tate, the Lions keep talented youngster Kenny Golladay- nicknamed “Babytron” for comparisons to Lions legend Calvin Johnson- and Marvin Jones Jr. as well as a potential impact rookie Brandon Powell, Tate’s potential replacement. This shows the feelings Lion fans have for Tate, as he is a great personality and talented player. People fear this shows that they have given up on this year by trading away a star player. The Lions have seen a breakout year from rookie running back Kerryon Johnson, who seems to be the best running back the Lions have had since Barry Sanders. Fans have been wishing for this for years now. A young, talented offensive line was built with two first round picks, including last season’s first rounder Frank Ragnow, a third-round pick, and two talented free agent acquisitions in Rick Wagner and TJ Lang. The Lions defense is led by star cornerback Darius Slay, but inconsistency is behind him at the position as Nevin Lawson and Teez Tabor have struggled. The safeties are talented with an aging Glover Quin and converted cornerback Quandre Diggs just signing a contract extension. Tracy Walker, this year’s third round pick, seems to be Quinn’s apparent heir at the free safety position. The linebackers are the surprise of the season as under the radar free agent signing Devon Kennard leads the team in sacks as of now. Jarrad Davis, last year’s first round pick, has been inconsistent, but shows the flashes of being a potential star linebacker. The defensive line has been ravaged by injuries, including those to free agent-to-be Ziggy Ansah. Da’Shawn Hand has been the fourth highest graded interior defender according to Pro Football Focus. He was a fourth-round pick this season and is already playing like one of the best defensive lineman in the league. Throw in the recently acquired Damon “Snacks” Harrison and the Lions have two of the best defensive lineman in the league. Overall, the Lions have plenty of potential to compete as long as Matthew Stafford is leading this team. With young stars Johnson and Golladay, the Lions have a core for their future to be successful. Star player Dylan Larkin is the brightest hope for the Red Wings future. However, the Wings just lost one of the best players in franchise history, as Henrik Zetterberg retired this offseason due to a back injury. Throw in a handful of young forwards and the Wings have plenty of depth for the future. Michael Rasmussen, Andreas Athanasiou, Tyler Bertuzzi, Anthony Mantha, and the injured Evgeny Svechnikov all have bright futures as all are under 24 years old. First round pick Filip Zadina may be one of the Wings best prospects in years, yet he is destined to spend some time developing in the AHL. There are plenty of veterans on the defense, however, Mike Green, Danny DeKeyser, Niklas Kronwall, and Trevor Daley are all aging in a developing league built on speed. Goalie Jimmy Howard remains, however he is in his 12th season, so the Wings must look for a new goalie soon. Overall, the Red Wings have so much talent in their forwards, with all of them potentially developing into stars, but they need to start gaining this same depth on defense with an influx of youth and will need to get a new goalie before they can return to the playoffs again. Meadows has a similar belief mentioning how the Wings should, “continue to lose for the first pick in the draft next year where they can get the sure talent. They don’t have the players they once had like Lindstrom.” The Red Wings will be relevant again, but it will take some time and a little bit of luck with their young players. The Pistons have surprised to start this season, starting with a 4-0 season With the dynamic frontcourt of Andre Drummond and Blake Griffin, the Pistons have plenty of star power in the post. Griffin recently went off for a 50-point game in a win against the Philadelphia 76ers. At point guard, the Pistons have the oft-injured Reggie Jackson, who has struggled to remain consistent as injuries continue to throw him off. When fully healthy, he has performed at all-star caliber level. His backup, Ish Smith, has been highly productive off the bench and is one of the better backup point guards in the NBA. At the shooting guard and small forward positions is where the Pistons have their issues. Perhaps the young player with the most potential, Luke Kennard has a smooth shot and a knack for making plays, however, he is injured at the moment and out for the next month or two. Another wing, former first-round pick Stanley Johnson, has struggled to live up to what has been expected of him. Johnson still remains the Pistons best defensive player, but his offense has seen many issues as his shot has developed slowly. Sharpshooter Reggie Bullock was one of the NBA’s biggest surprises last season, consistently making shots and scoring points for the Pistons. A rotation of these players has been used at the wing positions including second round pick Bruce Brown Jr, who has made some big plays and seems to be trusted by new head coach Dwane Casey. Casey was signed after he received the Coach of the Year award last season as head coach of the Toronto Raptors. He has often struggled in the playoffs, but he has developed numerous players into stars and the Pistons hope he can do so with their youth. 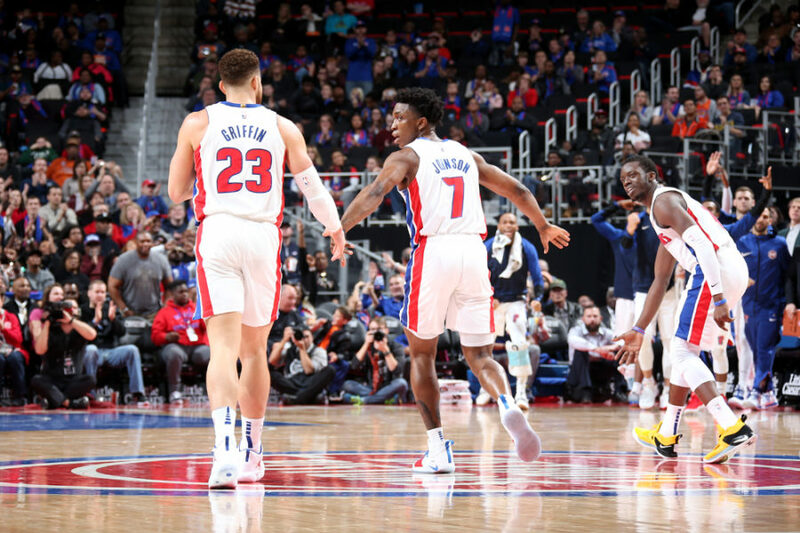 The Pistons may make the playoffs in the weak Eastern Conference these next few seasons with their stars keeping them in games, but they need to find a consistent playmaker at point guard and their young players must develop further for the Pistons to take the next step as a contender for the Eastern Conference title.